The Huon Small Farms Expo brings together producers, breeders, community groups, animal associations, rural finance and real estate, manufacturers and more, all in one spot at one time. With product demonstrations, special Expo deals, animal exhibitions, world class speakers and experts at every stall happy to answer your questions, it is a one of a kind event and can’t be missed if you live rural or dream of leaving the rat race. 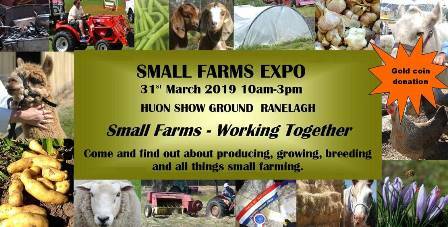 The Huon Small Farms Expo is entering its fifth year in 2019. After a great first year in 2015, it has gotten bigger and better every year since and the expo is returning for 2019, with more planned; animal exhibits, speakers, industry representatives, local organisations, entertainment and demonstrations.